Previous PostAnd Now For Something Completely Different …Next PostHello world! Welcome back! 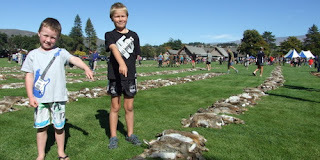 Those rows of dead bunnies is just wrong. Very, very wrong. Good luck with the summer temps this year. You may just get a S. TX summer and I can be all sympathetic and moan and groan with you about how you literally melt when you just look out the window. Welcome back Dr. The gardens of New Zealand are now safe. We had an 8 day run of unseasonably warm temps and then it has been cold, windy, and rainy ever since. All the brief heat did was make us soft when the cold returned. I totally agree that it’s harder and harder for people to be ignorant about climate change and global warming. We had a rather late spring season this year and it seemed to have lasted for a week or so. We’ve also had a few days of really rough weather.